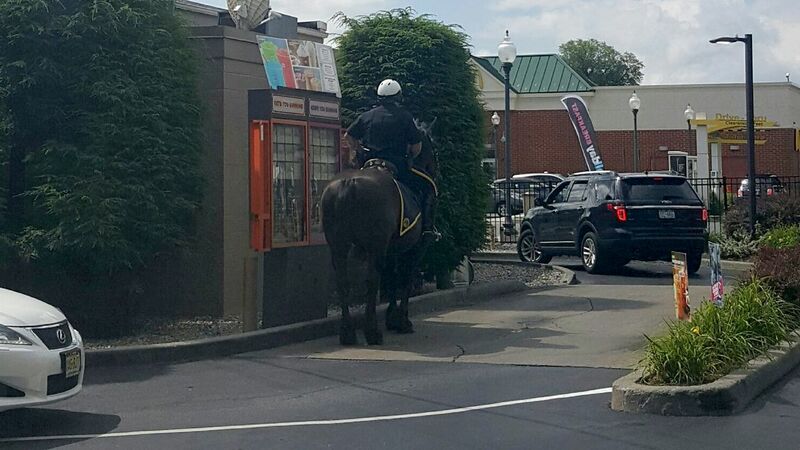 SARATOGA SPRINGS, New York (WABC) -- A mounted police officer in upstate New York has been spotted going through a Dunkin' Donuts drive-thru on horseback. Kasandra Carda posted a photo on social media showing the officer and his partner in line at the Saratoga Springs drive-thru Wednesday. WCVB-TV reports Saratoga Springs Officer John Sesselman ordered a cup of coffee for himself and a glazed munchkin for his horse partner, King Tut. The treat is well-earned for King Tut. The department posted pictures of the horse and Sesselman patrolling the city's downtown Wednesday, noting, "King Tut works hard and doesn't mind if you stop to pet him!"